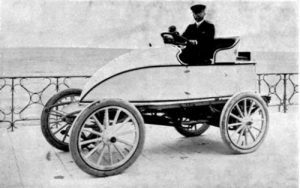 Cars, people and events in this week’s Motoring Milestones include: world land speed record, Volvo, Trans-Am and Formula One. 1955. The Wankel rotary engine dispenses with separate pistons, cylinders, valves, and crankshafts, and its construction allows it to apply power directly to the transmission. 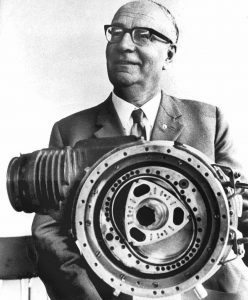 The miracle of the rotary design is that a rotary engine can produce the same power as a conventional engine of twice its size composed of four times as many parts. There is a tradeoff, however. The Wankel rotary engine burns up to twice as much gasoline as a conventional engine, making it, among other things, a heavy polluter. Proponents of the engine argue that its smaller size would allow carmakers to install anti-pollution devices where they wouldn’t fit in a car carrying an ordinary engine. The basic unit of the rotary engine is a large combustion chamber in the form of a “pinched oval” or epitrochoid. Within the chamber all four engine functions take place in the three pockets formed by the rotor and the walls of the combustion chamber. In the same way that the addition of cylinders increases power in a conventional engine, the addition of pockets increases power in a rotary engine. GM, after having considered the production of a rotary engine for a decade, finally decided against the innovation on the grounds that its poor fuel economy would be prohibitive to sales……. The Lincoln Versailles, a luxury-compact based on the Ford Granada chassis was introduced as a competitor of the Cadillac Seville during the grand opening ceremonies for the Renaissance Center in Detroit, Michigan, US [15 April 1977]……. 30 years ago this week, reigning world champion, Frenchman Alain Prost driving a McLaren MP4/3 won the Brazilian Grand Prix at Jacarepagua [12 April 1987]. It was Prost’s fourth victory in the Brazilian Grand Prix, expanding his own record. Prost won the race by 40 seconds over local hero Nelson Piquet driving a Williams FW11B…….20 years ago this week, Daimler-Benz presented the high performance sports car 6-litre V12 CLK-GTR [11 April 1997]. The Guinness Book of World Records recorded the CLK GTR as the most expensive production car ever built at the time, with a price of $1,547,620 (USD)……. The Argentine Grand Prix held at Autódromo Oscar Alfredo Gálvez in Buenos Aires, Argentina was won by Jacques Villeneuve in a Williams-Renault FW19 [13 April 1997].……10 years ago this week, in San Francisco Mayor Newsom brokered an agreement to ban cars from Golden Gate Park’s main road for 6 months of the year and to make permanent a Sunday ban for a smaller area [13 April 2007]. The deal still required approval from the board of Supervisors……. The MINI Cooper D went on sale in the UK [14 April 2007]……. Felipe Massa driving a Ferraru F2007 won the Bahrain Grand Prix held at the Baharain International Circuit from Lewis Hamilton, who made history to become the first driver ever to finish on the podium in all his first three races [15 April 2007]……. A 2.0-litre petrol engine ordered by a customer for a new three-door version of the BMW 1 Series became the one millionth engine to be produced at the Hams Hall plant since production started at the state-of-the-art West Midlands factory in January 2001 [16 April 2007].